Above: graphic of Bacteriophage Lambda showing combined lytic and lysogenic processes. Image measures 500 pixels across, original image is 2784 pixels across. This virus can either reproduce quickly (left hand side of diagram) causing the host cell to disintegrate and release new virus particles, or the viral genome can join the host genome (right hand side of diagram) and be carried silently as the bacterium reproduces. 1. LYTIC - left hand side of diagram: here the DNA quickly replicates. Phage proteins can also be seen being synthesised on bacterial ribosomes (the phage RNA is shown as yellow strings and the bacterial ribosomes are the associated small red bodies). Some of these proteins assemble into new phage heads and tails. The replicating DNA is then fed into new phage heads. 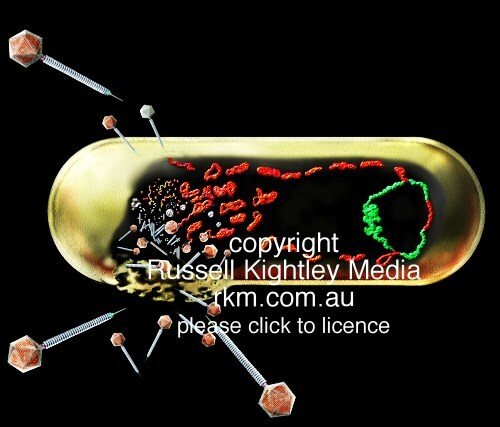 Once the phage heads are full of viral DNA the tails are attached. The bacterium finally breaks up (lyses - shown as a disruption of the bacterial cell at lower left) with the consequent release of progeny virions. 2. LYSOGENIC - right hand side of diagram: here the DNA migrates to the bacterial chromosome (itself a circle of DNA, drawn in green) and joins the bacterial DNA, a process called integration. The phage DNA, thus integrated, can reproduce quietly along with the bacterial DNA during bacterial reproduction. This can go on for many generations. In its integrated form, the viral genome is called a provirus (or prophage). Under certain conditions (which might threaten the survival of the host bacterium) the integrated viral DNA frees itself from the bacterial DNA and proceeds quickly to replicate and create new virus particles. This is illustrated as phage DNA moving to the left to join the lytic cycle.